The opening day of the two day Victor Chandler New Year Festival at Ayr Racecourse goes ahead today after the course passed an early morning inspection. Clerk of the Course Emma Marley walked the track and declared the going as soft, heavy in places. Snow which had been forecast overnight failed to appear and a mainly dry day with the odd scattered shower is in prospect. Feature race is The Bet Mobile At Victorchandler.com Handicap Chase over 2 miles 4 furlongs due off at 1.55 pm and the seven strong field includes no fewer than five Scottish trained runners. A precautionary inspection will be held early tomorrow (Tuesday) ahead of the second day of the meeting. 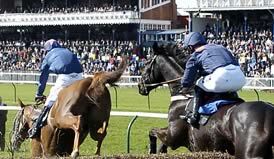 Ayr’s first race today (Monday) is due off at 12.20 pm with the Tuesday card starting at 12.35 pm. Gates open both days at 11.00 am.